"We are recruiting for the right combination of talent, experience, passion and training; Cinematographers, Writers, Actors, Audio Engineers, Lighting Gaffers, Grips, Audio Designers and other Digital Artists that want to join a team of serious filmmakers." The film making community in the NoVa/DC area is pretty small, so this is a great opportunity for local film makers or recent graduates to network. Quick! Leave a comment here today and give yourself a chance to win free tickets to the True Womanhood show tomorrow night. Brightest Young Things is going to choose one of the comments on that page to get a pair of tickets saving you $20. TW is playing with local sensation Deleted Scenes Thursday night at the Black Cat. Last time TW performed at the back stage of Black Cat I had a great time, and am looking forward to their show tomorrow! The local Virginia Homebrewers group is having their first meetup tonight. They will be trading beer recipes and secrets at 7pm at the amazing Sweetwater Tavern in Centerville. "This group is for those beer lovers who want to go beyond just drinking beer, but creating beer. A meetup to share recipes, techniques, but most of all homebrewed beer. Whether you are a wheat beer lover or a Irish stout drinker, this group welcomes all those who want to dabble in homebrewing." Tonight the DC Rollergirls were hanging out at famous and wonderful local dive Rocket Bar. They were raising money for their Eastern Regionals in Carolina by selling $3 shooters or challenges at pool or arm wrestling. I have a feeling very few men were able to beat those tough women at arm wrestling tonight. Finally made it out to a delightful evening at the Jazz in the Garden, despite the torrent of sudden rain showers concluding the event early. 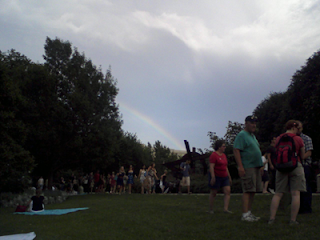 The storm earlier in the day did provide the short lived rainbow pictured here. The festival is held every Friday night at the Sculpture Garden at 7th & Constitution Ave. A live band fills the park with jazz as people either pack around the pond, walk around the grounds, or relax on blankets in the grass. It is also a great people watching scene, as this also attracts the young see-and-be-seen DC crowd. It is highly recommended to get their early (music starts at 5pm) to stake out a good patch of grass and bring a few blankets to lay on. Also you can bring your own food, but alcohol is only allowed if purchased there (police patrol the garden and will confiscate your wine from home if you don't hide it well). You can also buy $25 picnic baskets which has everything two people need to enjoy the night. There was also charitable events you could donate to, as Shannon was raising money for the Leukemia & Lymphoma Society by selling water bottles and freezy pops. It's a great charity that fights blood cancers, and if Shannon raises $1,800 for their cause she can run in the Marine Corp Marathon. Good luck! 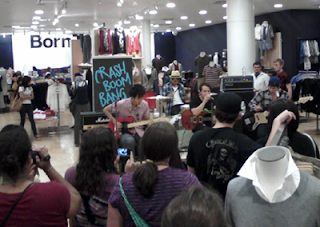 I stumbled upon an unexpected live music performance in Tyson's Corner tonight as Crash Boom Bang was playing at The Gap! I was very surprised at the concert in a commercial shopping space, but it was successful in drawing in a moderate sized crowd into the store. Crash Boom Bang is a local light rock / pop quartet that reminded me of a combination of the Killers and the Jonas Brothers. 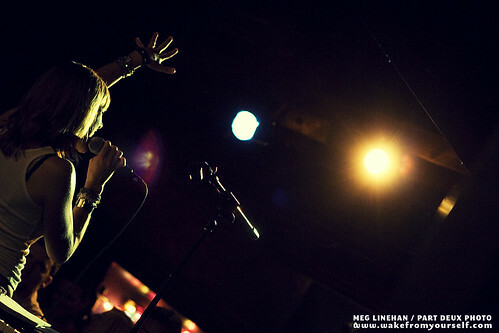 One of the best kept secrets of the local music scene is open mic night at Iota on Wednesdays. Previously, anyone could sign up to perform two songs, most of which where acoustic guitar solos. The night usually features a variety of talent and styles, and there is always at least one amateur musician who will impress you. As new hosts take the reign of managing the open night, Iota changed the format tonight. Todd, Rich and James now run two separate open mic times on Wednesday - 7:30pm and 10pm. There was not a two song restriction on the performers. It seemed like a rough start for their open mic, along with numerous audio problems. The talent of those who entertained us ranged from incredible to you-really-shouldn't-be-up-there bad. Standing out amongst all the open mic-ers was the fantastically gifted Laura (pictured here in red). She played acoustic guitar and completely dazzled the crowd with her gorgeous voice. A former Clarendon resident just created an interesting site called Whats The Deal DC. The service is geared towards letting people take advantage of group discounts of local DC restaurants and venues, especially when you don't have a bunch of friends who want to join in on the activity. Its a good concept: The site negotiates group discounts with local venues. Anyone can sign up for the discounted rate, and if they get a minimum number to participate everyone gets the special deal. If not you don't get charged. Currently the deal is for a cheaper dinner at Leftbank. I'm following them on twitter and am looking forward to using the service! 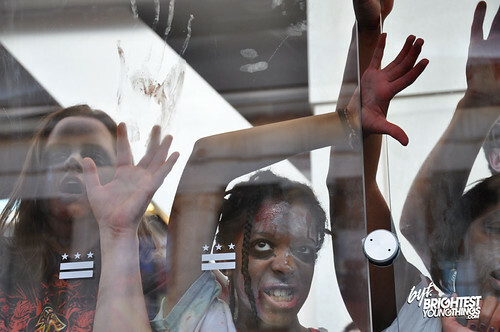 Good thing I was out of town at the fair Saturday when zombie mobs attacked DC. Thanks to Brightest Young Things to extensively covering the undead march in the capital when the mainstream media neglected to. Apparently the flash mob was organized by the people who did the No Pants Metro ride back in January. From the pictures it looks like quite a good number of people turned zombified themselves and roamed the DC streets, metro stations, and parks. I'm sure this thoroughly confused or irritated most of the tourists, but it doesn't appear as if anyone panicked and pulled out their Zombie Survival Guide. Its sad how unprepared most people are for when the undead attack. 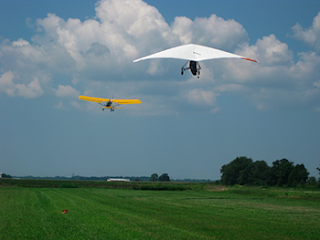 A great and unusual weekend activity, and a very memorable date idea, is hang gliding. The closest airfield that provides this is Highland Aerosports on the other side of the Bay Bridge. Hang gliding is incredibly safe and very fun. Its quite thrilling to be high up in the sky, with a completely unobstructed view, and to be able to pilot the glider slowly to the ground. There are two ways to do hang gliding: either strap in a glider and jump off a cliff or have an ultralight plane tow you up and let you glide down. Luckily for us there are no mountains close by suitable, so at Highland Aerosports they use ultralights. This is much safer as well as being far less nerve racking. Flights start at $145 for gliding down from half a mile up. This takes about 15 minutes and is absolutely worth it. Remember to bring sunscreen as there isn't any permanent shade in the landing field. Took advantage of the beautiful weekend weather and made the trip up to Montgomery County to walk around the 2009 Agricultural Fair today. Parking was $5 and entry to the park cost $8 per person. I recommend getting a funnel cake and lemonade as you enter, even if the only seats nearby to enjoy it is in the sun. The carny games are fun and typical of a fair, and there where an impressive number of rides available. I steered clear of the animal freak show, as I don't call five legged sheep and two headed pigs entertainment. I enjoyed the petting zoo with a good variety of both common barnyard stock and exotic animals. The "Chilly Mall" featured a HUGE selection of every type of candy available and organized into a maze-like isle. See the calendar of events here for more details, or check out the fair map PDF. 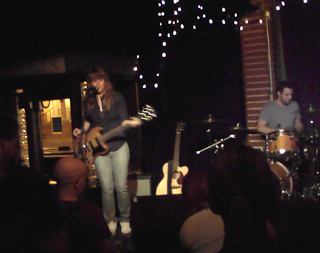 The local indie rock/powerpop Boxcar Collision played a great set at Iota tonight after a six month hiatus. They went on at 10:30 after glam/electronica 23 Rainy Days warmed up the stage. I'm a fan of their self titled CD, especially with the clean and catchy Boxful and La La For tracks. 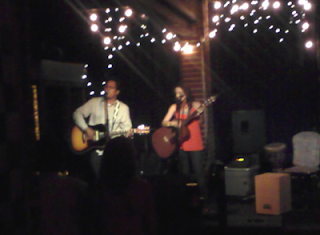 As always, Ashlee Wilcox vocals are impressive and I enjoyed her and Tom's rapport on stage. Vince played a mean bass line, such as in Drama Queen, that I'm very jealous of. Follow them on Twitter or stalk their blog, because I'm looking forward to more local shows. The 2009 Agricultural Fair has opened today in Montgomery County and will last for the next eight days until August 22. The fair is open from 10 am until midnight. The fair features a variety of attactions like magicians, hypnotists, a demolition derby, rodeo, monster trucks, tractor pulls, remote control car racing, and of course carnival rides. Washington Post's Going Out Guru’s monthly happy hour is being held tonight at the Clarendon Ballroom. Several birthdays will be celebrated at this event that lasts from 6 to 8pm. There will also be free cupcakes and a beach trip giveaway! Faccia Luna is a great unique restaurant on Wilson Blvd that I highly recommend. The upscale pizzeria features good Italian dishes and an intimate atmosphere, and has always gotten very nice reviews. "Faccia Luna is a collaboration between two Alpha Sigma Phi Fraternity brothers at Penn State, Bill McFadden and Joe Corey. Bill McFadden started the concept in Bellefonte, PA, where he introduced pizza to his then recently purchased restaurant, the Hofbrau House. When Joe Corey approached Bill in 1988 to open a pizza restaurant in an urban, Washington, DC neighborhood, both were of the same mind in the desire to open a pizzeria that looked more like an urban trattoria than the tired old corner pizzeria with its ubiquitous red-checkered oil-clothed table and candle wax-covered Chianti bottles." Tonight Iota was by the very personable and talented Jenny Owen Youngs, who showed she was versatile with the acoustic, electric guitar, bass as well as excellent vocals. The Beanstalk Library opened for her and were good enough to let her band borrow their strings. Jenny's beats were honest and contagious, and she was complimented by the bass and drummer backup from Chris Kuffner and Elliot Jacobson. Her songs were varied, from upbeat melodies to songs about breakups, divorce, and friends with cancer. One of her tunes was recently featured on "Weeds". I think I enjoyed her personality and humility the most. There is a Meetup for DC Nightlife this Saturday, August 15. "A Group dedicated on DC Nightlife, DC Nightclubs, DC Bars and Lounges in Washington DC. Info, upcoming events, parties, guest list, table service specials, Guest DJ's and everything related with Washington DC Nightlife." Local indie/powerpop band Boxcar Collision is officially back on stage after a six month hiatus! Ashlee Wilcox is returning as the talented and friendly vocalist, along with Tom on guitar and Bing strumming a fretless bass. A new drummer will be added to the group at the Iota show. Looking forward to hearing them again at the August 14th show in Clarendon. I'm also loving the robot in their show poster. 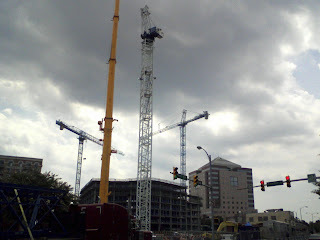 A tall fixed crane was erected today on the North side of the Clarendon Center project. The raising of the crane closed off Garfield street between Wilson and Clarendon Blvds. It towers behind Hard Times and is now the third crane to be used in the project. The south side project is continuing quickly, with 5 out of the total 12 stories framed. 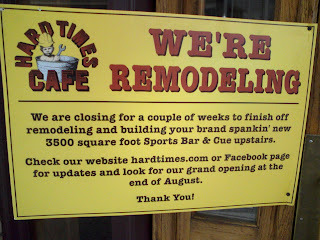 Hard Times is closing temporarily for remodeling and the addition of a new 3500 sq ft Sports Bar & Cue. Hard Times has reported spent $80,000 buying new TV's for the venue. The addition will be on the second floor of the old Underwood building that is currently being flanked by the under-construction Clarendon Center. Hard Times is a mainstay venue in the heart of the Clarendon strip, and offered night owls food until 3am. Looking forward to its return soon! The newly rebuilt Safeway in Tysons Corner is hosting a free wine tasting today. Stop in to try a variety of flavors on Saturday between 1 and 6pm. "I thought it could be enlightening just to hear from regular people how they feel about our health care system. So, I'm looking for stories about their experiences, their views on health care, what they'd like to see happen in the future, stuff like that. Then I'll be posting each story as I get them. I don't care if they're pro or con. I only care that their honest. " Some great photos are just went up of the very talented Juniper Lane. 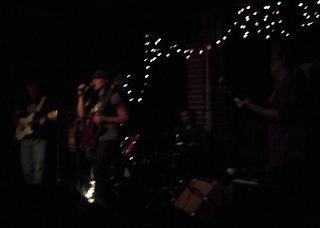 Here are the pics when they played Iota last Friday night. Rumored to be gone for good, Boxcar Collision is scheduled to make a comeback at Iota on August 14th! There last show was at the Red and the Black in February, and my sources told me it would probably be their last show together. If true, I'm looking forward for their return to Iota in two weeks!